What keeps you from posting your art online? Whatever your reasons, you're not alone! 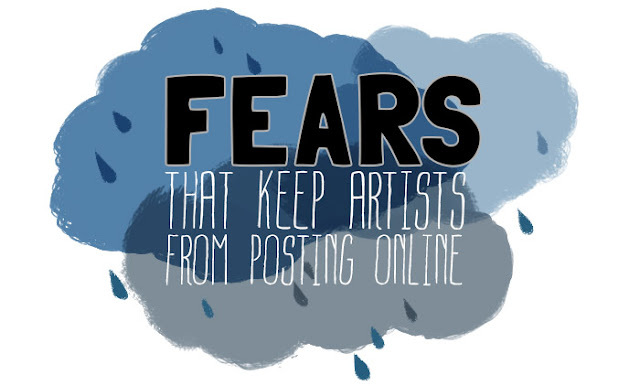 A fear of posting online is something I hear very commonly from beginning artists - which is a shame, because there are many benefits to posting your artwork online. Not only can doing so bring you work, but it can also help you develop an extremely valuable network of fellow artists who can encourage and guide you. When people tell me about their fear of posting online, I've noticed five common themes. Fear of being seen as an impostor. I know an artist who doesn't post online because of her "lack of credentials," as she puts it. She's hesitant to write blog posts because she thinks people will read them and say, "who does this girl think she is?" I think she imagines the internet as a small party, where when you walk in everyone turns and wonders who you are and who invited you. You can't just show up at a small party. But the internet is more like a big party, where no one notices if you show up, and if they do, they assume you're there for a reason. Trust me, people won't ask about your resume. (Edited to add: Obviously, don't spout off long posts about topics you have no experience in. That's not what I'm saying here.) Credentials, expertise and confidence are built by doing things, not by holding back. If you're making stuff, you have credentials, so join the big internet party. Fear of being ignored. Oh, you're definitely going to be ignored. Again, the internet is a big party - don't expect the room to stop and stare just because you show up. Everyone is ignored at first. Bestselling author and Youtube celebrity John Green, who gets greeted at movie premieres by throngs of screaming teenage girls, has said that his first book readings were attended by three or four people. Being greeted with e-crickets online doesn't mean that your artwork is bad, it's just that it takes years of consistent online posting to begin to develop a following - so start now. Those internet celebrities you see who get thousands of retweets or reblogs - they've probably been posting consistently for years, and they started out just like you. Being ignored is the first step to not being ignored. Fear that their art isn't good enough. The internet is not a sacred space for only The Perfect of Art. It is full of people of all skill levels posting all kinds of drawings. If you post a drawing that's less than great, no one will hold it against you and remember it forever. In fact, people like following the progress of someone who is working hard and improving. They find it really inspirational to see someone share their struggles and their hard work. If you wait to post your artwork until it's perfect, not only will you never post anything, but you'll miss out on opportunities to inspire others and be encouraged by them! Fear of their artwork being stolen or copied. Yes, artwork does get stolen from the internet. However, this is a fear I see disproportionately expressed among beginning artists. For example, recently I was reading a forum thread where a 15-year-old, who was posting typical high school anime-style sketches, was expressing paralyzing anxiety that someone was going to steal her drawings and ideas. This is, to put it gently, unrealistic. Again, there are millions of artists posting millions of images online every day. Unless you become extremely popular, the chances of your art being stolen are pretty slim. Do what the professionals do: protect yourself by watermarking all your artwork with your name and website, uploading low-res images, and consider registering your copyright on your pieces. Then let it go. Fear of not being the best. I've heard some people say, "It feels pointless to post online when there are so many other people posting amazing art." Yes, there will always be artists who are better than you. There will also always be artists who are worse than you. You will never be the best or the worst artist in the world. What matters is that there is something unique that only your art can bring to the world, and the world needs it from you. It isn't your responsibility to be the best artist in the world. It is your responsibility to go about developing your talents to the very best of your ability. Yes, posting your artwork online is scary. You may be ignored. You may get some negative comments. You may feel like you're wasting your time. All artists feel these things, even the ones who seem confident and successful. Do it anyway. Keep drawing. Keep posting online. Choose to be busy with drawing rather than busy with self-doubt. Over time, people will begin to notice your hard work, I promise. And you'll look back and wonder what you were so afraid of in the first place. Amazing article. Lately I've been leaning towards point 3 and 5 too much, which isn't great, but hey, I'll hopefully past that stage. This article turned out great-- it gently but encouragingly hits on so many reasons why I've personally heard people say they won't post their work. I am gonna go reblog this everywhere so maybe someone will take heart and post The Thing they've been hesitating to post. Thank you, Joie! Hearing your perspective on this topic was very helpful.